Friday, April 26, 2019 - 7:30-9 a.m. The public is invited to join with United Way of Sumner County as we celebrate the efforts of the individuals businesses and groups who made a difference in the community during our 2018 fundraising campaign. 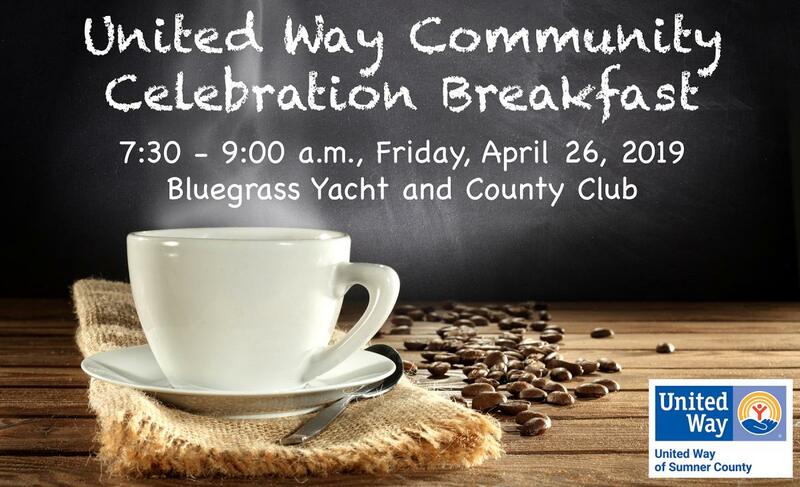 The United Way Campaign Celebration Breakfast will take place from 7:30-9:00 a.m. on Friday, April 26, 2019, at the Bluegrass Country Club in Hendersonville. Admission is $17 each, and tickets can be purchased online or by mailing a check with a list of attendees to the UWSC office by April 24. In addition to revealing how much was raised during the 2018 Campaign, the event will recognize and honor the donors, advocates, and volunteers who made a difference for others over the past year. Awards presented include volunteer of the year, fundraiser of the year, advocate of the year, best overall workplace campaign, and more. This year's celebration will also include a preview of the exciting things we are planning for the next 12 months. Make your plans now to join us at the UWSC Community Celebration Breakfast. This is Your United Way! We are more than the fundraisers. We are the hand raisers. The game changers. United Way of Sumner County fights for the health, education, and financial stability of every person in every community. Because change doesn’t happen alone. Hope isn’t a one-man band. We have one life. To live better, we must LIVE UNITED.